Facebook done military style – with a twist! I’m always a bit dubious about facebook for business, as it’s a bit of a hit and miss environment. Most people are on facebook for a bit of light entertainment, and don’t really want to see work-related stuff. But where facebook comes into its own is when it involves a group or community, so it’s perfect for a business that relies on a group of people interacting. One in particular stands out for me as actively engaging everybody, being genuinely informative and most of all fun. 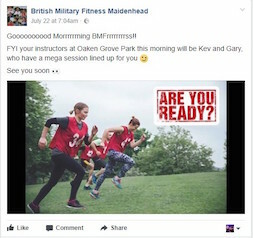 They run 4 sessions a week, and before each session they post a message saying who will be running the class so people know the name of the instructor (it’s the same 3 or 4 that rotate) and encourage people to get to the class with some cheeky banter. After each session they post a motivational message and pictures of the session in action including a couple of funny ones. Sometimes they do facebook live and record the session as it’s taking place, inviting comments from those not attending who are watching from their sofa … or trip away – whatever ‘excuse’ they have for not being there. Every month there is a social, and this is advertised as an event on the page, inviting everyone to attend. It’s basically making best use of facebook and it works really well.